Sir Arthur Conan Doyle, born May 22, 1859 in Edinburgh, was the creator of Sherlock Holmes and a passionate believer and advocate of Spiritualism. He wrote several books in support of the movement and also toured with a popular lecture. Houdini and Doyle struck up a friendship in 1920 when Houdini traveled to the UK after the war. Houdini told Doyle he was a "seeker of Truth" and "willing to believe." While in the UK, Houdini visited over 100 mediums recommended by Doyle. But at every sitting, he recognized trickery. Nevertheless, Doyle believed that Houdini himself had supernatural powers and wrote to him: "My dear chap, why go around the world seeking a demonstration of the occult when you are giving one all the time?" In 1922, Doyle came to the United States to lecture on Spiritualism. While on vacation together in Atlantic City, Lady Doyle gave Houdini a seance in which she purported to mak contact with Houdini's mother. Doyle believed Houdini had been convinced and said so in the press. But Houdini responded publicly that he had not been swayed. Their exchanges, both public and private, became more heated, and eventually their friendship dissolved. Doyle continued to voice support for mediums Houdini exposed, such as the famous Margery, and Houdini ridiculed Doyle's gullibility. While the men never reconciled, after Houdini's death Sir Arthur reached out to Bess with a heartfelt letter of condolence, ending with: "I am sure that, with strength of character (and possibly his desire to make reparation), he will come back." 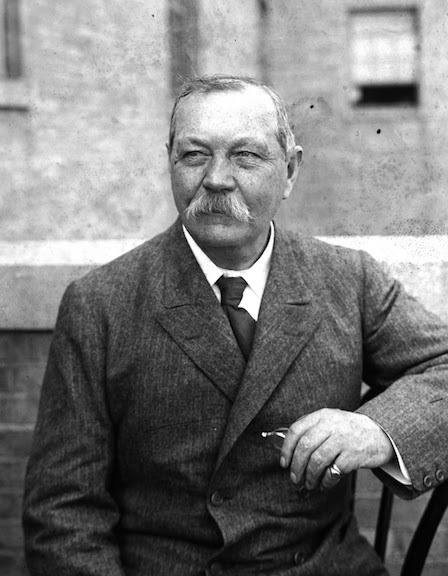 Sir Arthur Conan Doyle died on July 7, 1930. He never wavered from his belief that his former friend was "the greatest physical medium of modern times." Much has been written about Houdini and Conan Doyle. To date their have been three major books, numerous pairings of the men in fiction, including movies, plays and comic books, and even a 2016 television series.